Recently established in 2018, at the heart of the East Coast of Singapore, Maverick Martial Arts is a traditional Brazilian Jiu-Jitsu (BJJ) school that offers a variety of classes for adults, teens and kids (from 4yo). The school is the only De La Riva affiliated gym in Southeast Asia. Owned and ran by two high experienced BJJ coaches and Martial Arts enthusiasts, Pedro Wolff (from Brazil) and Chris Chua (from Singapore), the dojo offers high quality training for all levels – including beginners – a safe and clean environment and the best team of members ever! 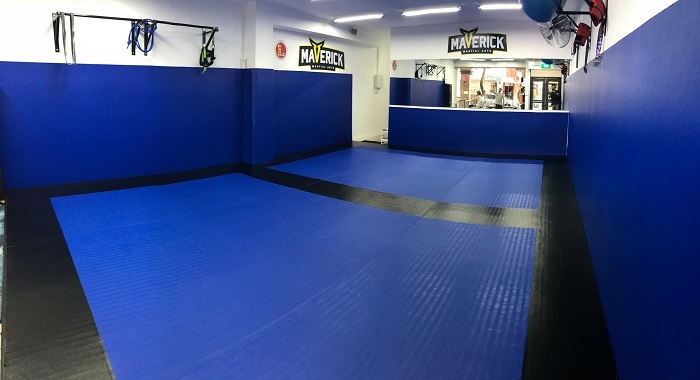 Maverick Martial Arts is very well located on the busy and trendy Joo Chiat Road, with all options of transportation on its surroundings and a car park almost in front of it. For a quick bite after training, you won’t regret exploring the variety of local and traditional restaurants for which the street is famous for. According to the dictionary, the word “Maverick” stands for “a person who thinks and acts in an independent way, often behaving differently from the expected or usual way”. And that is what we stand for, independence. Freedom to think and act. Freedom to create, to develop, to change and to exchange. To share. To dare. To challenge yourself to be yourself. To be your best self. Embrace your passions and overcome your fears. Free your spirit. Be a Maverick. Come check us out and join us for a free trial!